What is the real English profiency level of Vietnamese? VietNamNet Bridge - While an education organization has ranked Vietnam in the seventh position among 21 Asian countries in proficiency of English, some experts call the result ‘flashy’, saying it does not reflect the real situation of English learning and teaching in Vietnam. In the latest ranking by EF (Education First), Vietnam is in the seventh position in English Proficiency Index (EPI) in Asia. Since 2011, when the first EPI report was released, Vietnam has been continuously upgrading its English proficiency. According to EF, this year’s position for Vietnam is lower because of the higher number of countries included. The scores given to Vietnam in 2018 are all higher than 2017 and the years before. The ranking by EF shows the high readiness of Vietnamese youth for global integration. However, some teachers of English have voiced their doubts about the ranking. They spoke about a report by the Ministry of Education and Training (MOET) that says 78 percent of students attending the 2018 high school finals got below 5 (average score) on the English test, and the average score was 3.91 on the 10-score scale. 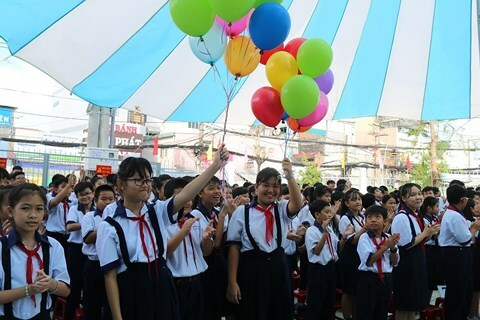 According to Cao Huy Thao, former headmaster of the Vietnam-Australia International High School, there are hundreds of rankings on EPI like the one announced by EF. Each organization follows its principle and criteria. However, as the ranking was based on analyzing tests selected by random, the results may not truly reflect the real situation of using English in every country. Nguyen Thi Minh Ngoc, a lecturer of the HCMC Economics University, cited a report as showing that nearly all employers complained that most university graduates cannot communicate in English fluently. “Some candidates got 550 TOEIC scores, but they could not pass job interviews because of their poor English skills,” Ngoc said. Lu Thi Hai Yen from the Dak Lak Pedagogical Junior College said that teaching at schools was not good. She said in modern times, traditional teaching method is still applied, while the student-centered modern has not received appropriate attention. “Teachers read lectures and students take notes on their notebooks in all English lessons at non-foreign language schools,” she said. In Vietnam, a student’s English skills are assessed by learning records and exam scores. In teaching English, much importance is attached to grammar. “However, in fact, their English is not good enough to help them communicate with foreigners,” Yen said. A survey conducted by a team from the HCMC Industry University found that only 4.26 percent of students said they could practice speaking skills before entering university.